Christians across the world mark the resurrection of Jesus Christ today [Easter Sunday] in many varied and distinct cultural ways. In Nepal, Easter is not a public holiday however the government has given Christians permission to celebrate these important events. Christian churches in Nepal hold an evening fellowship on Good Friday to remember Christ’s crucifixion. On the Sunday morning,Christians meet at dawn to commemorate the resurrection of Christ. Just as Mary and Martha did[the two women who went to his tomb before sunrise and saw Christ. Nepali Christians gather for a sunrise service to affirm that Christ has risen from the dead. 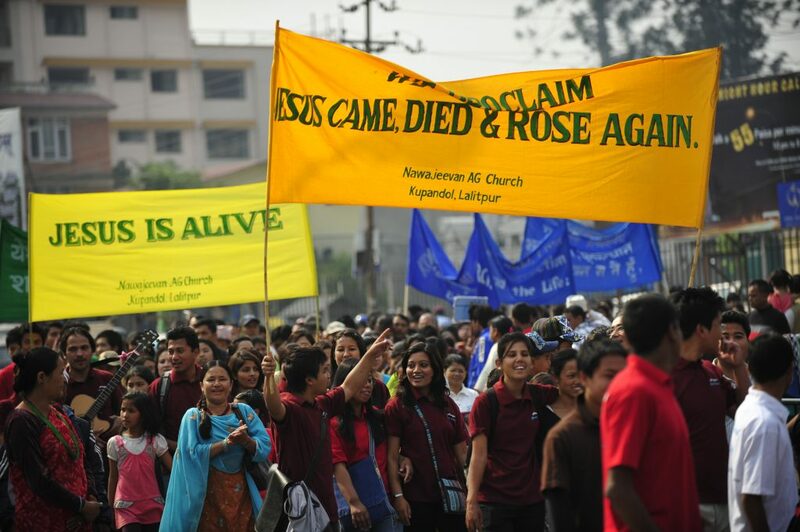 After the service, Christians from larger cities, such as Kathmandu, rally in the streets to mark Easter Sunday. They walk through neighbourhoodssinging, playing musical instruments and proclaiming the name of Jesus. Books and pamphlets containingthe gospel are distributed..
Christians will then gather together in open public spaces after hours of walkingthe streets. Well-respected Pastors share sermons followed by avariety ofprograms. Churches from across the Kathmandu valley will participate in these activities. As a secular nation it is very difficult to declare the name of Jesus in Nepal. Regardless,the numbers of Christian continues to increase showing the ongoing growth of God’s kingdom in Nepal.